It's 520am right now... EST that is. But I woke up at 4am or so... stayed in bed as much as I could ... but I couldn't go back to sleep. Mind as well get up and write a review (which I did). Now, I am waiting. Starving but I can't eat.... you see my surgery is today! So I need to be at the hospital at 8am. And make sure I am there on time because if not - I will beb bumped. Kids are at the inlaws... Weird to have a house without kids around.... sooooo quiet suddenly. So I am having a forefront reconstruction and bone graft... Below is my x-ray that was done earlier this year! See my right foot? That's the one who will get operated this morning. Left one was done when I was a teenager but what a job it was... not so great. So my right big toe is turning towards my left foot. My doctor will correct that which explains the bone graft. She will use part of the bone she will remove to fix the toe. 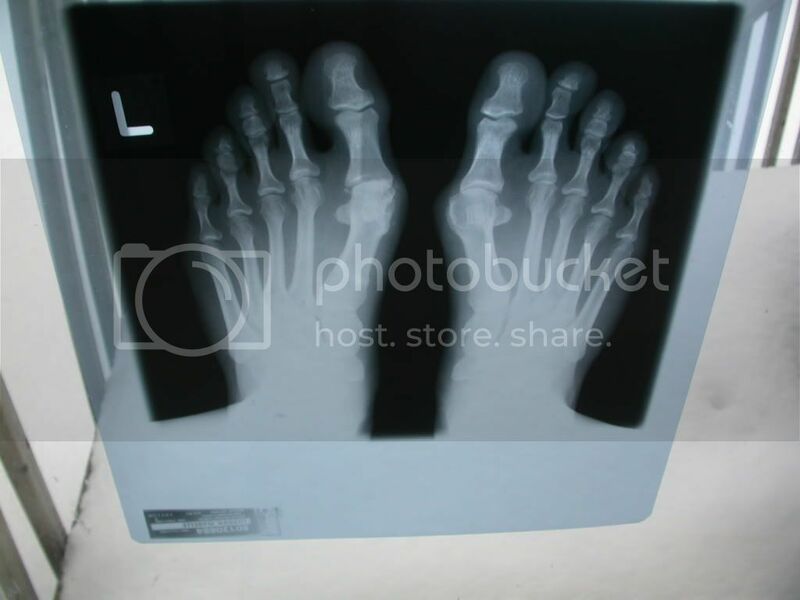 and now this week - Nov 2008 - a forefoot reconstruction with bone graft. I am thankful to have the best surgeon in the city to do it. I trust her ... even if I met her only 2 times so far. She knows what she is doing... after all she has cases worse than mine. It was a long wait but it was worth it. Quebec decided to create their own preschool show after debating if they will translate Sesame Street or not. And I think it was a good idea. Oh don't take me wrong Sesame Street is great but Passe-Partout was wonderful and believe me when I say translating shows sometimes misses some of the quality. Personally I think that the only company who does a great job at translating their movies would be Disney. So back to Passe-Partout. A few years ago, someone had the idea of bringing back the episodes on DVD.... and since then we have now 5 sets of DVDs on the market. We actually own 4 of them. The fifth one came out this week... And I am going to do to Costco to see if they have it. Passe-Partout is a must in our household. Being French-Canadians we want our kids to be exposed as much as possible to French. They pick up English pretty good thank you and some have the tendency to speak in English before French. So now we try to have them speak in French first. So if they speak in English, we ask them to say the same thing in French. If they have trouble then we say the sentence and need to repeat behind us. Voilà. Last night, pass 8pm but before 9pm (sorry I can't remember the exact time - oupsy! ), our friends the Driegers had their fourth baby - a boy this time after three marvelous little girls... His name is Kieran John Driedger. I can't wait to see him. Now I will have to go shopping - LOL... boy stuff obviously. Seem like Julia had enough of boy clothes though so I am thinking hard of what to buy him... Boy toy maybe? Mmmmm! Do I look forward to it? Partly yes, partly no. Yes because the pain will be gone... No well I can't drive for 6 weeks. Fortunately it will be Christmas time.... but still... cold winter.... can't wear a boot and the cast is only a half foot one... Bummer. So we bought BIG socks and see how I can wear these. And I still have my grand-father moccasin which are quite large. I have the best doctor in town... I know because of her reputation. I am in good hands. Thank you Lord for bringing me to her. ... finally the time as come!!! We emptied the rest of the school room on Sunday and left a message to my in-laws. They showed up this morning with their painting gear. Today, it was fixing the little holes, preparing the room and putting the white on the baseboards, around the door and window, the door itself (which I had to prepare with tape because it's a French door), the crown moulding and the ceiling. I am sort of fed-up with some status lines in Facebook.... I don't mind learning when a new baby is born and so on... but honestly I don't really care about whoever did clean their house or has a crappy day or is sick ... well you get the point! So since I went back to Facebook, I am trying to keep my friendships low and I was wondering what to do with the status line. While on our trip this summer, we went to some outlet stores in PA and in Maine. In the Maine ones, there was an outlet from Reader Digest and I went in it. We found christian books for the kids as well as a little treasure book for me. The title is THe Teacher's Calendar (school year 2007-2008) a dayd-to-day Almanac to historic events, holidays, Famous Birthdays and more! This book cost me 1$ !!! And it has a lot of interesting facts. I already had Every Day a Holiday by Silvana Clark but this one has something for every days of the year. Mind you it's not the new edition (as they print a new one every year) and I have to be careful for certain things but the historic information is accurate. Did you know that in 1885 at 9:30am (PT) the last spike was driven at Craigellachie, BC, completing the Canadian Pacific Railway's 2,980-mile transcontinental railroad track between Montreal (QC) (Hey I was born there! ), in the east and Port Moody (BC), in the west? HAPPY ANNIVERSARY CP!!! Did you know that Marie Sklodowska Curie was born in 1867? She was a polish chemist and physicist. Born in Warsaw, Poland. In 1903, she was awarded with her husband, Pierre, the Nobel Prize for physics for their discovery of the element radium. She died in Sallanches, France, in July 4, 1934. Did you know that today is the anniversary of the republican symbol (1874)? Thomas Nast used and elephant to represent the Republican Party in a satirical cartoon in Harper's Weekly. Today the elephant is still a well-recognized symbol for the Republican Party in political cartoons. Did you know that today is the anniversary of the first black governor elected? In 1989, L. Doublas Wilder was elected governor of Virginia, becoming the first elected black governor in US history. Now, Nov 4th 2008 will be the anniversary of the first african-american president....! So today is not quite lost after all... Alexandre spent some time on the site of Time4Learning which I will write a review for in the weeks to come. Alexandre can easily do some things there by himself. Dominic and Jérémy ? that's another story. Dominic is too fast and doesn't listen to the instructions... Jérémy is having trouble with the mouse... So I do it for him but he gives me the answers. Okay, I think this is well done... Not sure I would attempt it though. However, I wonder why thesong Brown Eye Girl is attached to it.... I would have picked something with vegetables on it like the song in French....Tous Les Légumes which I learned when I was in the girl guides - looooooog time ago! Étaient en train de s'amuser HÉ ! Tant qu'ils pouvaient HÈ !